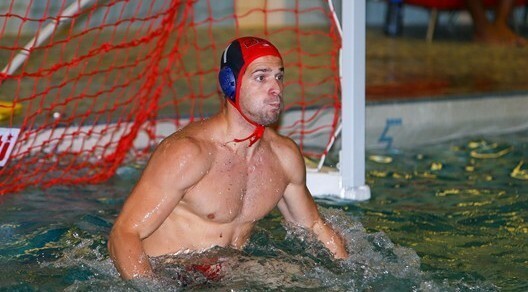 The SFBK Men’s Water Polo team defeated the Fordham Rams 11-5 on Oct. 31, 2013. This leaves the Terriers 15-9 overall and 9-2 in CWPA play. Tonight’s game celebrated the team’s five graduating seniors. Before the game began, Igor Mladenovic, Marko Dzigurski, Luka Vukomanovic, Tyler Perkins and Bosko Stankovic received praise for all of their accomplishments. In the first quarter, Fordham’s Nicholas Allen scored two back-to-back goals, giving the Rams a 2-0 lead. The Rams held the Terriers to scoring only one goal in the second quarter. Vuk Vujosevic cut the deficit to one, right before Fordham’s R.J. Simmons scored another goal. At half time, the Rams lead the Terriers 3-1. The Terriers fought hard in the third quarter. In the first three minutes, both Vujosevic and Balint Toth scored back-to-back goals. This tied the match at 3-3. Toth scored again with four minutes left, to give the Terriers a one-point lead. With the assist from Toth, Bosko Stankovic scored for the Terriers. Ilija Djuretic also scored for the Terriers, allowing them to lead Fordham 6-3. Dzigurski came off the bench and scored for the Terriers within seconds. The Terriers lead 7-3 when Fordham called a time-out. Mladenovic didn’t allow any goals in the third quarter. The Terriers’ Liam Veazey opens the fourth quarter with a goal. Terriers lead 9-3 after a goal in the second minute of play. Mladenovic allowed Fordham’s Simmons’ shot in the net. Djuretic scored his second goal of the game with just over two minutes left. The Terriers lead 10-4. Vukomanovic scored a goal to give the Terriers a five-point lead, but Fordham’s Allen grabbed fired one behind Mladenovic. The Terriers won 11-5.